Living is a science, and it demands reflection. For many centuries it has been the custom of students of esoteric wisdom and truth-seekers to keep diaries, so as to record and evaluate their experiences in the art of observing life, and of observing themselves. 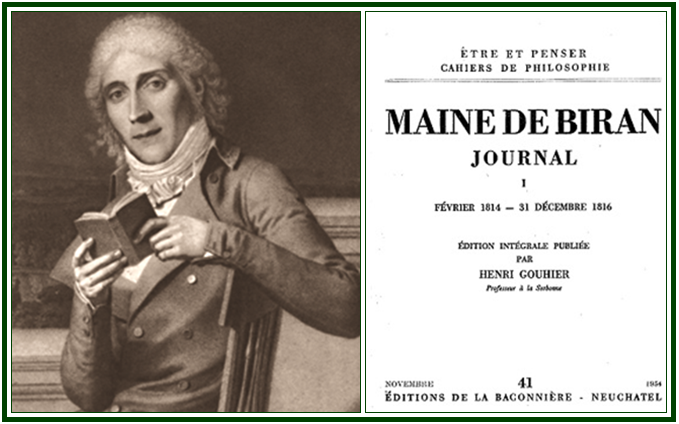 In the early 19th century, French philosopher Maine de Biran (1766-1824) followed the same time-honoured tradition and used his diary as a tool for obtaining self-knowledge. He often practised self-observation in parallel lines with the observation of Nature and of the weather conditions around him. His studies in the mutual interaction between the state of physical nature and the state of one’s mind are also of theosophical interest. The topic has not deserved enough attention. In any occasion or circumstance, chronological time is a natural resource of decisive importance. Timing constitutes a science in itself. One second can make a decisive difference. The practice of observing one’s daily, monthly, and yearly use of time leads to a gradual improvement in one’s energy-efficiency. An effective use of it is inseparable from the ability to save one’s life-energy. An entire lifetime is but a page in the Book of Life, and it is up to each individual author to decide about the contents of such a page. But time-planning must not be too rigid: while the general structure can be defined, actions and events should be allowed to flow. Maine de Biran never cared too much about having his writings published. For him, they were mainly personal records of an individual research. When he died, his writings remained forgotten and abandoned for a few years, before being rescued from destruction and then published, little by little. The striking honesty and directness of Biran’s Journal gives the reader a first-hand report about the thoughts of a wise truth-seeker living in France 200 years ago. Maine de Biran strongly influenced philosophers like Victor Cousin (who is mentioned by Helena Blavatsky once or twice for his “History of Philosophy”); Félix Ravaisson (who is quoted in her article “Memory in the Dying”); Henry Bergson (who won the Nobel Prize for Literature in 1927), and others. But it is the value of Maine de Biran’s books in themselves which must be taken into consideration above all. He made an important investigation on the relation between the Physical and Moral Consciousness in man , a subject which is of critical importance for those who try to live and to act according to elevated ideals. He was a thoughtful member of the Masonry , and actively took part in the social and historical events of his time, which he comments in the present Journal. Biran died in 1824, exactly seven years before Helena Blavatsky was born. His life, his ethics and ideals show that he had much in common with modern theosophy, of which he was a precursor among others. “Letters from the Masters of the Wisdom”, First Series, edited by C. Jinarajadasa, TPH, Adyar, India, 183 pp., 1973. The volume includes a collection of letters to L. Holloway; see Letter II, p. 149. “Maine de Biran Par Lui-Même”, Henri Gouhier, Éditions du Seuil, Collection Écrivains de Toujours, copyright 1970, Paris, France, 190 pp, see pp. 73-90. See also “Essai sur L’Emploi du Temps (1808)”, Marc-Antoine Jullien, Édité et présenté par Kareen Illiade, Economica-Anthropos, Paris, 2006, 136 pp. Although Biran did not concentrate his efforts on the science of using time, the planning of such a natural resource is clearly present in his personal writings. Among other texts and books, see “Rapports du Physique et du Moral de L’Homme”, Tome VI Des Oeuvres de Maine de Biran, Librairie Philosophique J. Vrin, Paris, 1984, 207 pp. And see “Nouvelles Considérations sur les Rapports du Physique et du Moral de L’Homme”, text included in the “Tome III” of the “Oeuvres de Victor Cousin” (pp. 413-461), Société Belge de Librairie, Hauman Et Co., Bruxelles, 1841, 530 pp. “Influence de L’Habitude sur la Faculté de Penser”, Maine de Biran, Presses Universitaires de France, Paris, 1954, 242 pp. “Maine de Biran – Oeuvres Choisies”, Aubier, Éditions Montaigne, Paris, 324 pp., MCMXLII (1942), see p. 18.